FRIENDS! 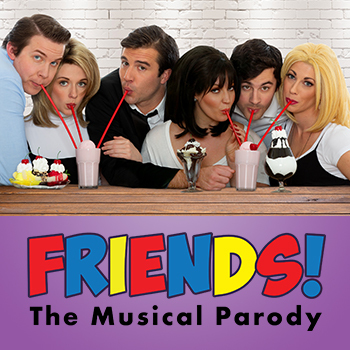 The Musical Parody celebrates and pokes fun at the wacky misadventures of a group of 20-something pals as they navigate the pitfalls of work, life, and love in 1990s Manhattan. It's a seemingly typical day at New York's only coffee shop, Central Perk, until an unexpected runaway bride with beautiful hair enters the picture and kicks the whole gang out of second gear. Due to adult situations and language this show may not be appropriate for children under 17 years of age.